Nubia V18 mid-ranger will be announced on March 22nd - Playfuldroid! The month of March is indeed a fulfilling month for all smartphone enthusiast as the month sees the unveiling of a number of highly anticipated Chinese smartphones from Huawei, Meizu and Vivo. 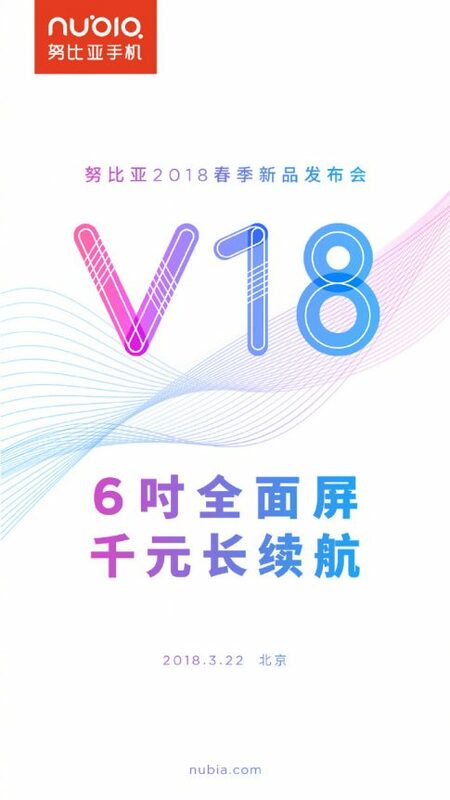 Right now, it seems like Nubia will be joining the party as well after the smartphone maker released a press invite earlier today for their upcoming Nubia V18 launch event. Currently, there is still little information regarding the Nubia V18 as the most recent leaks and rumors focuses mostly on the upcoming Huawei P20 flagship which is slated to be announced on March 27th this month. That being said, we do know that Nubia is currently preparing a gaming-centric smartphone which is unlikely to be the Nubia V18 as the press invite do dropped some hint that the V18 will probably be priced around 1,000 Yuan ($158). Aside from that, the invite also mentioned that the Nubia V18 will be coming with a 6-inches fullscreen display on its front panel. This however, seems a bit questionably given that Nubia had just announced the Nubia N3 last week, which also sports a 5.99-inches fullscreen display as well. Perhaps, the main differences that set them apart could be their design and hardware specifications. For now, let’s hope to hear more about the Nubia V18 in the coming days!